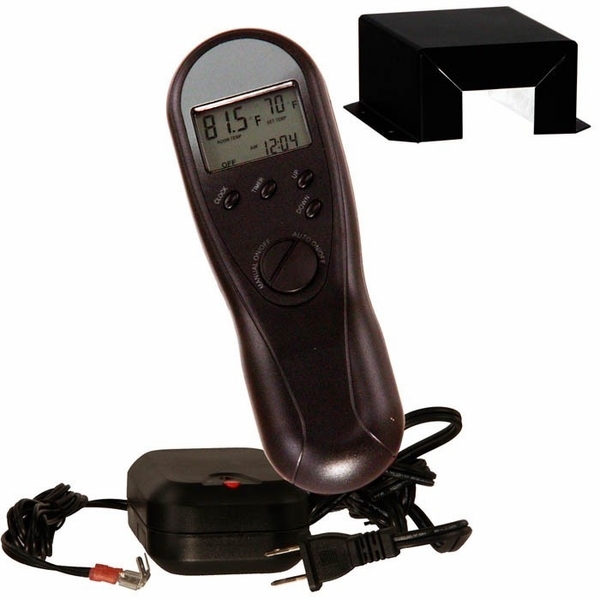 Take control of your fireplace with handy AC remote control kit. It allows manual on/off operation and has a thermostat to keep your room at the perfect comfort level. The remote features a childproof design for safety and an LCD screen that is backlit for great readability. The unit has a low battery indicator and features a clock and a countdown timer. A convenient room temperature set point makes operation easy, and it displays the temperature in both Celsius and Fahrenheit. An insulated heat shield is included. Standard 120 VAC is used. This worked great to replace our out of date-not working unit on our 15 y/o fireplace! Thank you for expert help in finding the one that was compatible! No problems ,very nice and a good price . ProsGreat place to do business with . The two gas fireplaces in our house were originally equipped with Acumen remote control units with battery operated receivers. To put it mildly, they "ate" AA batteries! I replaced both units with Acumen Model D remote control units which use AC power for the receivers. The installation went very smoothly and the units work great! Just one thing. Follow the instructions to the letter when setting up the security code feature. The sequence of steps is crucial to a successful setup. Needed a replacement kit but the one that was sent did not work properly. Your customer service team was very helpful and sent out another kit which works very well. ConsFirst kit that was sent did not work properly. Didn't work for me until . . .
Like the review from "Simin M.", : "Did not work when I first hooked it up - Soon realized I needed to sync the code between the remote and receiver even though I had not changed it from the factory presets." It didn't work for me until I changed the code - first, I tried changing only one number and followed the instructions - still didn't work. Then I changed a second number and, YEAH! - success. Fantastic! This unit replaced my 15 year old unit PERFECTLY! 3 minute installation and it works as good as the old unit. A dealer was going to charge me over $300.00 to replace unit. 5 star rating! Bought this remote control to replace one that went bad after 7 years of use. Extremely easy to install and worked correctly right off the bat. Would highly recommend this product. This unit works perfectly. Finally we don't have to manually adjust our gas fireplace. Nice simple unit - installed and working in half an hour. Remote is uncomplicated and easy to use. Tend to use our Gas fire a lot more as in thermo mode we can keep the room at a comfortable temperature - before the fire would run constantly and the room became very hot. Fire shuts down about 2 degrees above the set point and relights about 2-3 degrees below the set point. ConsDid not work when I first hooked it up - Soon realized I needed to sync the code between the remote and receiver even though I had not changed it from the factory presets.